What is Non Point Source Pollution and How Does it Affect Me and My Watershed? Did you ever think about what happens to a raindrop that falls onto the Silver Creek watershed? It may land on a tree or other vegetation and evaporate in the hot sun. It may land on a farm field and soak into the ground, or it may land on a rooftop, driveway or roadway and travel down the street to a storm drain. Educating yourself about NPS and what you can do to help manage it is the first step to improving Silver Creek or any water source. Development of the land for homes, commerce and transportation has created huge areas of “impervious” surfaces where there once were forests, fields and streams capable of absorbing precipitation. Water that falls on these types of surfaces has to go somewhere, so it “runs-off”. TIPS ON BECOMING PART OF THE NON POINT SOURCE POLLUTION SOLUTION! Limit the impervious areas around you home. Grass and natural ground cover can be attractive and practical substitutes for asphalt, driveways, walkways, and patios. A system of natural grasses, trees, and mulch can effectively limit continuous impervious surface area. Wooden decks, gravel or brick paths, and rock gardens keep the natural ground cover intact and allow rainwater to slowly seep into the ground. Go native whenever possible. Native plants are suited to this area and require less maintenance, have lower requirements for water, fertilizers, and pesticides. Minimize grassed areas which require high maintenance (mowing). Preserve existing trees, and plant trees and shrubs to help prevent erosion and promote infiltration of water into the soil. They will absorb up to 14 times more rainwater than a grass lawn and don’t require fertilizer. Test the soil to prevent over fertilization. Avoid using fertilizer near surface waters. Use buffer strips or thick vegetation along waterways to slow runoff and soak up pollutants. Compost grass clippings and leaves. Never allow them to wash into roadways where they will reach storm drains or fill ditches. Gutters and down spouts should drain onto vegetated or gravel-filled seepage areas- not directly onto paved surfaces. Splash blocks also help reduce erosion. Divert runoff from pavement to grassy, planted or wooded areas of your yard, so stormwater can seep slowly into the ground. Do not over-water your lawn or garden. This increase the chance of fertilizers leaching into ground water. Using slow-watering techniques such as trickle irrigation or a soaker hose reduce runoff and are 20% more effective than sprinklers. Click above to be directed to more information about septic systems and how to properly maintain them to protect water quality. Dispose of household hazardous wastes properly. Many household products contain toxic ingredients that can be a threat to public health and environment when disposed of improperly. Do not pour them down the toilet or any drain. 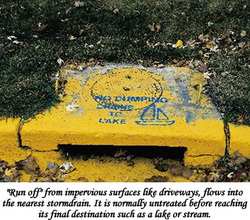 Storm drains often lead directly to a water source such as a stream or river. Contact county solid waste management Office for information regarding hazardous waste collection in your area. Place all litter in trash receptacles. Never throw litter in streets or down storm drains. Don’t hose down driveways or sidewalks. Dry sweeping paved areas, along with careful trash disposal, are simple, effective pollution reducers. Recycle used oil and antifreeze. Putting one quart of oil down a storm drain can contaminate up to two million gallons of drinking water! Clean up all pet waste. Pet waste contains nutrients and pathogens that can contaminate surface water. Get involved in the community by starting a Stream sweep or other clean-up activity. Encourage local officials to develop ordinances that help reduce NPS pollution. Visit the tab to the left titled Rain Barrels and Rain Gardens.